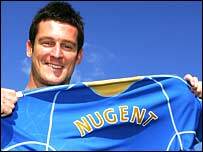 Portsmouth have completed the signing of England striker David Nugent from Championship side Preston North End. The two clubs reportedly agreed a £6m fee for the 22-year-old and he passed a medical and signed a four-year contract at Pompey on Wednesday. Nugent was unveiled alongside Nigerian striker John Utaka and Pompey boss Harry Redknapp said: "Hopefully, they'll give us a lot up front." "I'm delighted to get David and will be delighted if he gets double figures." Nugent opted to join Pompey after Sunderland also had a bid accepted by Preston. The striker's hopes of joining boyhood idols Everton faded after Toffees boss David Moyes refused to pay more than £4m. Nugent said: "I wasn't going to wait around for ever. There were two clubs interesed and I went away to have a think, it's a big decision for me. What do you make of Pompey's Nugent swoop? "I can no longer play for England Under-21s and I have to break into the senior squad. I'm now playing in the Premier League which will further my career. "I met Harry and straight away knew where I was going. "He sold the club to me on the players he is bringing in, the squad is full of great names." Redknapp added: "The days of strikers scoring 40-odd goals in a season like Clive Allen are long gone so we are putting no pressure on David, but every time I have seen him play he has done well. "I think it gives a sign of how far we've come. We've signed Sylvain Distin, Hermann Hreidarsson, Muntari and now Nugent this summer. We are full of quality."